Design and maintain your databases with maximum efficiency. DeZign for Databases is an easy-to-use; repository-based data modeling tool that help you design, document and maintain databases for desktop and client/server applications. Entity Relationship Diagramming. DeZign for Databases uses entity relationship diagrams (ERDs) to graphically design databases. In your diagram you can visually make a design using entities, relationships, subcategories, group boxes and text blocks. Relationships are drawn between entities and can include a name, abbreviation, description and the cardinalities (zero, one, many, ...). You can create identifying and non-identifying relationships. The diagram editor user interface fully supports drag-and-drop of entities, relationships, subcategories, group boxes and text blocks. Moving an entity automatically results in a redrawing of your relationship lines. Industry standard design notations. You can draw your entity relationship diagram (ERD) based on data modeling notations defined by IDEF1X or Crow's Foot (Information Engineering). Read more. Multiple display modes. DeZign for Databases will display model information at various levels. These display modes can be used at various stages of model development or can be used to convey model information in abstract or in varying depths of detail. You can display an entity with all attributes, keys only or no attributes but only the entity name. You can use indicators for key attributes. Another display option is to show the data types next to the attribute name. Use the display indexes option to display all indexes or non key indexes. Pan and zoom window. 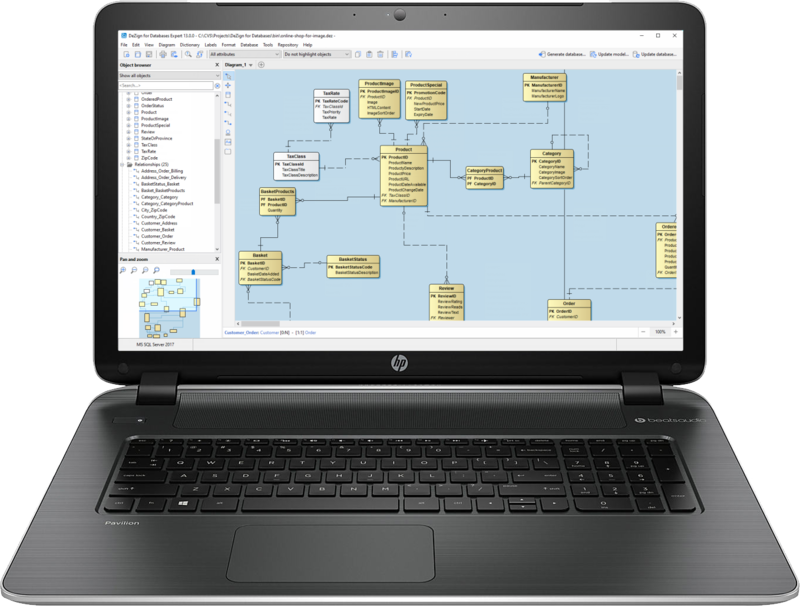 Quickly navigate around large diagrams with the Pan and Zoom window. This window gives you a "birds-eye" view of your diagrams. ER-Modeling. DeZign for Databases supports the ER-modeling techniques. Some advanced features like N:M-relationships (many-to-many relationships) and sub categories (inheritance) are also supported. "DeZign for Databases" will take care of the translation of the ER-Diagram (your database design) to the physical database (your physical tables or your SQL schema). DeZign for Databases supports the logical and physical data-level from a single specification achieved by using automatic foreign key migration at design-time. A modification to a property of a relationship or to a primary key will automatically affect foreign keys. Reverse engineering. You can use DeZign for Databases' reverse engineering capabilities to create a data model diagram of your current database system. You can import an existing database by connecting to the database directly or by importing a SQL DDL script. Your complete database will be imported including tables, foreign keys, sequences, triggers, procedures and views. While reverse engineering, the software analyzes the database to find relationships not expressly defined to the database. Read more about generating and maintaining database schemas. Develop large models. You can create a model in any edition of DeZign for Databases as a .dez file. However, if you need to develop large models with many users, you might prefer to store your model in a (server-based) repository database. This facility is available in Teamwork Edition of DeZign for Databases. Datanamic Repository. The Datanamic Repository is a free central repository database to store your data models. The Datanamic Repository approach allows more than one user to work with the same data model. The data model file is stored in the repository database and every developer working with the DeZign for Databases Teamwork Edition can work on the project individually. Later changes can be committed to the repository database and shared with the team. The repository works much like the source code version control system with conflict resolution and automatic merging. Repository Administrator utility. Manage repository users and repository projects with the Repository Administrator utility. This is a free utility. Using DeZign for Databases, you can save different versions of a model for archiving, comparisons or altering a database purposes. These versions are stored in the project file. Manage versions. You can archive your current model, delete versions or edit the version label or the version comments. You can always return to an older version of your data model. Automatically save versions. DeZign for Databases can automatically create a version of your data model when you save your project to disc and when you generate a database or alter a database. Compare versions. DeZign for Databases offers advanced, bidirectional comparisons between two versions. Changes made to the data model will be made visible and DeZign for Databases can generate intelligent alteration to update your database. DeZign for Databases provides flexible, customizable reporting and printing capabilities. Read more. HTML, MS Word and PDF reports. DeZign for Databases enables reporting and documentation of designs through generation of HTML, MS Word and PDF formatted reports for easy deployment of design information. Several reports with different levels of detail can be generated. Optionally the diagram can be inserted as a picture. Export diagram as image. The diagram itself can be printed or exported as a png, bitmap, jpeg-image, gif-image or windows metafile. Model validation. You can validate a model for errors any time during the design process. During validation, DeZign for Databases checks to make sure the elements in your model are correct and complete. Automatic foreign key migration. DeZign for Databases supports the logical and physical data-level from a single specification achieved by using automatic foreign key migration at design-time. A modification to a property of a relationship or to a primary key will automatically affect foreign keys. Reusable objects. Domains are reusable user-defined types or "attribute templates" that promote consistent domain definitions. You construct domains as you would attributes, specifying a name, datatype properties, default values and validation rules. Afterwards, you can reuse them in your data model by applying them to attributes and table columns. Attribute packages are pre-defined, reusable sets of attributes that promote consistent attribute definitions. You construct attribute packages as you would entities, specifying a name, attributes with datatype properties, default values and validation rules. Afterwards, you can reuse these attribute packages in your data model by applying them to entities. You can share attribute packages between data models. Name templates. The name templates editor lets you create naming rules for entities, relationships and constraints that can be reused across the model. Please see the Supported databases document for an overview of what is supported for each target database. Switch target database. You can easily switch to a new target database for your model. DeZign for Databases will automatically translate the data types. For the conversion of the data types, DeZign for Databases uses data type mappings. You can easily change these mappings in the Data type conversion rules editor. Database-independent models. DeZign for Databases supports two types of data models: a data model targeted for a specific DBMS or a database-independent model. For database-independent models you work with portable data types and select the target DBMS when you generate or alter your database.